A Nasa spacecraft has sent back historic first pictures of an unexplored region of Mars. The Mars Phoenix lander touched down in the far north of the Red Planet, after a 680 million-km (423 million-mile) journey from Earth. 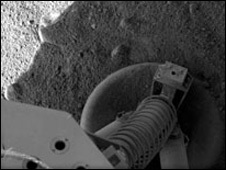 The probe is equipped with a robotic arm to dig for water-ice thought to be buried beneath the surface. It will begin examining the site for evidence of the building blocks of life in the next few days. A signal confirming the lander had reached the surface was received at 2353 GMT on 25 May (1953 EDT; 0053 BST on 26 May). Engineers and scientists at Nasa's Jet Propulsion Laboratory in California clapped and cheered when the landing signal came through. 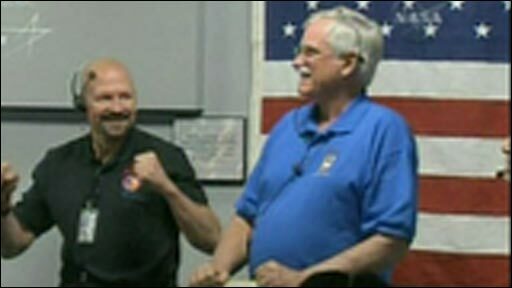 "Phoenix has landed - welcome to the northern plain of Mars," a flight controller announced. The final seven minutes of the probe's 10-month journey to Mars were regarded as the hardest part of the mission. The probe had to survive a fiery plunge through the planet's thin atmosphere, slowing from a speed of nearly 21,000km/h (13,000 mph). It released a parachute, used pulsed thrusters to slow to a fast walking speed, and then descended the last few metres to the Martian soil to land on three legs. The Nasa team monitored each stage of the descent and landing process through radio messages relayed to Earth via the Odyssey satellite in orbit around Mars. "In my dreams, it couldn't have gone as perfectly as it did tonight," said Barry Goldstein, Phoenix project manager at JPL. Nasa found out more about the landing when pictures from the probe reached the Earth. The first images showed the "Arctic plain" where Phoenix came to rest - a region of Mars that has never been seen up close before. Other shots confirmed that the probe's solar arrays had unfurled successfully, and that it had landed safely on its legs. The spacecraft will begin its three-month science mission in the next few days. It will use a robotic arm to dig through the protective Martian topsoil and lift samples of both soil and ice to its deck for scientific analysis. Dr Tom Pike of Imperial College, London, is part of the British team involved in the project. "The main goal of the mission is to get below the surface of Mars to where we are almost certain there is water," he told BBC News. He said orbiters flying around Mars had surveyed the landing site in great detail and found signs that water ice is buried 10cm or less below the surface. "Water, of course, is of critical importance because it is one of the building blocks - one of the essential habitats we need - for life," he said. Landing on Mars is a notoriously tricky business. 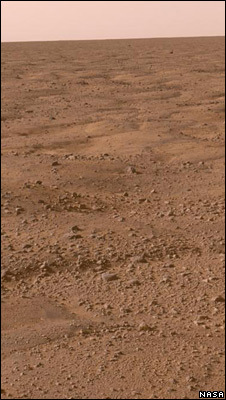 There has been about a 50% failure rate on all Mars missions since Russia launched the first one in 1960. Phoenix is an apt name for the current mission, as it rose from the ashes of two previous failures. In September 1999, the Mars Climate Orbiter spacecraft crashed into the Red Planet following a navigation error caused when technicians mixed up "English" (imperial) and metric units. A few months later, another Nasa spacecraft, the Mars Polar Lander (MPL), was lost near the planet's South Pole. 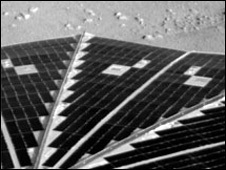 Phoenix uses hardware from an identical twin of MPL, the Mars Surveyor 2001 Lander, which was cancelled following the two consecutive failures. The probe was launched on 4 August 2007 on a Delta II rocket from Cape Canaveral Air Force Station in Florida.